For Molly Ray and Hartini Abdul Rahman, both doctoral students in WMU’s Counselor Education and Counseling Psychology (CECP) program, their academic work at WMU has contributed to a potentially life-saving service for the WMU community and given them an opportunity to talk about their research overseas to a global community of psychiatrists and counselors. 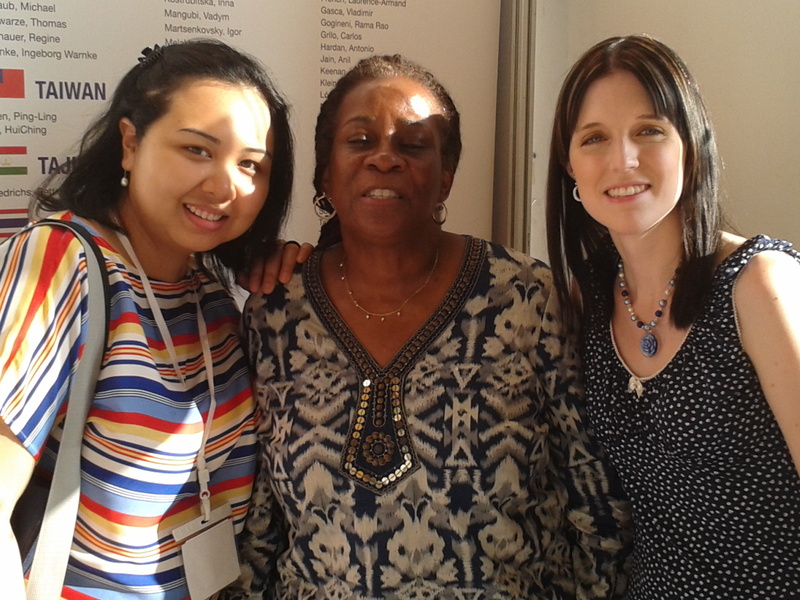 Last year, Molly and Hartini worked with their faculty advisor, Delores D. Walcott (Psy.D.) on the WMU Suicide Prevention Program, a program with the objectives of raising awareness of suicide and enhancing understanding of suicide prevention resources available to students, faculty, staff, and the greater WMU community. As part of their work on this program, Hartini and Molly helped to create a Resilience Building Workshop which was offered as part of the 2012 MLK Celebration Series and was aimed to promote resilience and increase knowledge about resiliency and its function as a protective factor against life challenges, especially in navigating the college environment. This spring, they will help to plan and participate in an all-day event (February 13, 2014) related to suicide prevention. Several weeks ago, I had a chance to speak to Molly and Hartini about their experiences and their plans going forward. Recently, you planned a suicide prevention program for the WMU community. Can you tell me a bit about this programming? Hartini: The Resilience Building Workshop was a part of the annual workshop series that the Suicide Prevention team has developed since 2012 for our participation in the MLK celebration series. The workshop was a two-hour long program that incorporated multiple educational approaches aimed to increase participants’ understanding of resilience and identification of possible strategies that they could use to increase self-resilience. This particular event was offered in 2012 (developed and facilitated by Megan Donnelly who was the doctoral student working with me at that time, and myself), and for 2013, Molly and I developed and facilitated a connectedness building workshop. For next year’s (2014) MLK celebration, we are bringing Mr. Jack Klott as our guest speaker for our day-long event. Can you speak a bit more about this upcoming 2014 suicide prevention event? Molly: Along with our supervisor and colleagues, we are currently in the process of planning an all-day event related to suicide prevention that will take place on February 13, 2014. The featured guest speaker will be Jack Klott, a local social worker who is the director of Suicide Prevention Consultants located in Grand Rapids, Michigan. Although several of the presentations/activities during the day will be targeted toward specific audiences (e.g. WMU staff, faculty, student groups, health care providers), there will be one presentation in the evening that will be open to all individuals at WMU, as well as individuals in the surrounding Kalamazoo area. This particular presentation will begin at 5:30pm, and will focus on the cultural aspects of suicide. Within this presentation, Mr. Klott will discuss suicide prevention with underrepresented (I prefer the term oppressed) populations. Members of the Suicide Prevention Program, including myself, will serve as hosts for the event. Our primary tasks are to ensure that everything is running smoothly, and to introduce to the audience the various presentations. How does this programming fit into your own research and academic work? Hartini: The program is fitting into my personal research interest and professional goals of helping to de-stigmatize counseling and mental health in college campus environment, especially on difficult issues such as suicide prevention and depression. I believe in a strengths-based approach to begin my conversations on these difficult topics, especially with students. For example, by understanding how they cope with their problems, we could help them identify areas of growth and increase their problem-solving and decision-making skills. Molly: The February 2014 event will provide the suicide prevention program another opportunity to assess how well we are reaching out to the campus community, and what people are taking away from our programs/trainings. In addition, through use of surveys, we can obtain a sense of what our program could be doing better, and what individuals’ expectations are of suicide prevention presentations. Overall, it is through research that our program can make continual improvement. In the process of administering and planning this workshop, Molly and Hartini ultimately created a poster presentation on the success and future directions for their program. A graduate student travel grant from the Graduate College provided part of the funding for both students to attend the 21st World Congress for Social Psychiatry in Lisbon, Portugal, where the women presented their poster and interacted with a global audience of students, faculty, researchers, and practitioners. Both women recall the experience as eye-opening and fantastic, and a chance to present their work in a surprisingly comfortable atmosphere. For Molly, one of the best aspects of the conference was the chance to “get out of the bubble of your own dissertation research, and to see branches of psychological study in other countries.” They both recall learning about the difficulties faced by social psychologists and counselors in other countries, specifically, the struggles to reach out and provide counseling support and information to populations who may speak a variety of different languages. You received a travel grant to attend a conference in Portugal to present your research. Can you talk a little about your experiences at the conference (academic or personal)? Hartini: Lisbon was definitely fun! The whole 7-day experience was down-to earth eye- and heart-opening, educational, full of adventure and also a time for self-care. We had the opportunity to meet and network with professionals of social psychiatry around the world and understand social issues of other countries and cultures. It made me pause and think about what I am doing for myself, my family, my culture and my environment. I felt a sense of connection with scholars, presenters, and friends that I met briefly during the conference, and they are from Canada, Morocco, Singapore, Lebanon and many more. Perhaps it’s because we shared the same goal or trying to understand human behavior and their connections, and help people make better choices in their lives. Lisbon itself is a place full of history and culture. I am more appreciative of cultural differences, openness, patience, creativity and the power of non-verbal communication, especially when you are travelling in non-English speaking countries. Molly: In a broad sense, our trip to Portugal was nothing less than amazing. I was very proud to be representing WMU at the 21st World Congress for Social Psychiatry. It was particularly important to me that I was representing counseling psychology in general, and my particular doctoral program (i.e. Counseling Psychology). What amazed me most about the conference was the diversity of topics individuals were researching. I became further aware of the particular mental health issues in various countries, and the struggles the countries were having with increasing mental health awareness. Although mental health education and practice may vary across countries, one commonality all countries shared is the stigmatization of mental illness. At the conference, researchers and scholars collectively agreed that across the globe, psychological disorders are highly stigmatized. Two major goals for all mental health professionals, regardless of their country of origin, are to increase local and national awareness of mental health issues, and work to de-stigmatize such issues. Overall, it was the diversity of the conference topics and attendees that energized me the most. I felt as though I could never learn enough. I returned to the United States with a broader understanding of psychology. Before the conference, I held the assumption that psychological research, practice, and education was generally similar across countries. As I interacted with conference attendees and attended presentations, I began to realize that psychology is defined and described differently depending on where you are in the world. Like almost every aspect of individuals’ lives, psychology too is influenced by culture and context. Although professors and instructors have told me this throughout my college education, I was finally able to see the cultural/contextual influence at the conference. In addition to the conference promoting my professional growth, I also felt that personal growth occurred as a result of my trip to Portugal. There were moments during the conference and while exploring Lisbon that it suddenly hit me how important the trip was for my professional development. Ten years ago, I never would have imagined I would be presenting at an international conference. In general, the trip prompted me to reflect on the struggles (academic and personal) I have overcome, and the moments of success I have had. My trip to Portugal was one of those times I felt it was warranted to give myself a pat on the back. I returned to the U.S. with increased professional (and personal) confidence, and an even stronger desire to continue on with my own research. As Molly and Hartini move forward in their programs and research, we know we’ll continue to hear fantastic things about their work and how they are representing the CECP program and the WMU Graduate College. Well done, ladies, and best of luck! Hartini, Dr. Walcott, and Molly have arrived! The WMU Campus-wide Suicide Prevention Program (established in 2006) was originally funded by the Substance Abuse and Mental Health Services Administration (SAMHSA) under the Garret Lee Smith Memorial Act (2004). This entry was posted in Uncategorized and tagged CECP, counseling psychology, counselor education, international conference, research, suicide prevention, travel.